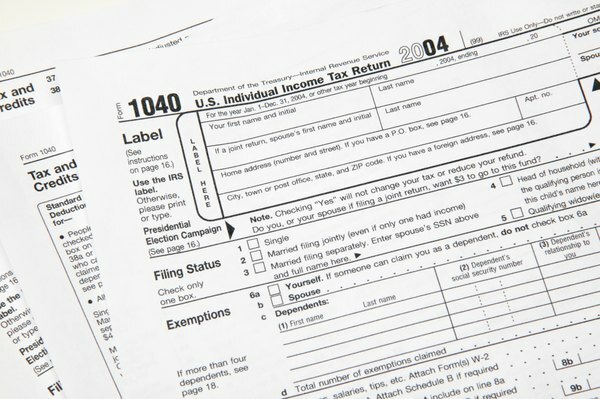 Include a casualty loss deduction on your Form 1040. 3. Do I Get an Extra Deduction for a Disabled Spouse? Being displaced from your home is a traumatizing experience, especially when coupled with a natural disaster. The Internal Revenue Service provides for this possibility and grants taxpayers a deduction for losses that are not otherwise covered by insurance. Additional tax relief is also available to ease the burden. The primary deduction for someone displaced from her home is a casualty loss deduction. Typically, a taxpayer has to do some math by deducting $100 from the amount of the loss and reducing the balance by 10 percent of her adjusted gross income. The remaining amount is deductible. When a natural disaster occurs, the IRS might allow the entire amount to be deducted or special legislation might allow for a higher deduction. If an employee's displacement from his home has forced him to travel farther for a job, he might be able to get a deduction for additional travel costs. This deduction is only for individuals who are working temporary jobs that are expected to last less than a year. If a business was forced to open new, temporary locations that require the worker to travel to new work sites, these travel expenses might be deductible. In the case of natural disasters, the IRS might provide an exemption for individuals who providing housing for people who have been displaced from their homes. For example, individuals received an exemption of $500 for each individual they housed after Hurricane Katrina. Restrictions might prevent a person from receiving the deduction if the displaced individual is the homeowner's spouse or dependent or if the homeowner did not provide housing for a long enough period. Reimbursements might be available if a taxpayer provided food, clothing or other necessities for the displaced individual. A deduction is also available for housing a student for part of the year. Among other possible deductions, the IRS might allow individuals displaced by natural disasters to postpone filing and to delay making payments for tax bills. The IRS may permit taxpayers to claim a higher amount of Earned Income Credit and Child Tax Credit if they have been displaced. Tax-favored withdrawals might also be available if a person who was displaced withdraws money from an individual retirement account. Taxpayers can deduct property losses that are not otherwise covered by insurance. Because tax laws can change every year, affected taxpayers should check for any recent revisions that might provide them with more -- or fewer -- deductions or advantages due to displacement.